Wil Burroughs (25) completes the steal during CVU’s win over Burr & Burton at the Kevin Riell Memorial Tournament championship game on Saturday. The Champlain Valley boys and girls basketball teams hosted the third annual Kevin Riell Memorial Tournament to kick off their seasons last weekend, and both teams started strong with tournament titles. The Redhawk boys topped Burr and Burton 55-40 on Saturday to win the title, holding the visiting Bulldogs without a field goal in the fourth quarter. 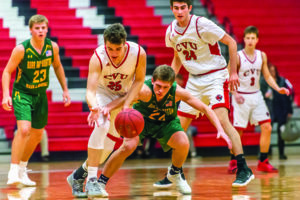 Will Burroughs, who was also named tournament MVP, scored 15 points to lead CVU, while Graham Walker added nine points and Cole Otley scored seven. Walker was named to the All-Tournament team. The Redhawks (2-0) opened the tournament with a win on Friday night, topping North Country 53-43 in comeback fashion. CVU outscored the Falcons 21-9 in the fourth quarter to advance to the final. Ethan Harvey had 11 points to lead CVU, while Nikos Carroll chipped in with 10 points. Maryn Askew gets to the line during CVU’s win over Burr & Burton at The Kevin Riell Memorial Tournament on Saturday at CVU. The girls basketball team also went undefeated at the tournament, topping North Country 57-45 in the first game and then beating Burr and Burton 64-24 on Saturday to win the title. 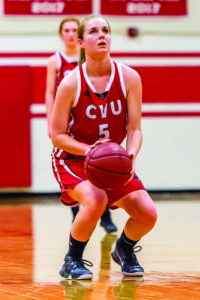 Lindsey Albertelli had 16 points and 10 rebounds to lead CVU over North Country. Albertelli, who was named tournament MVP, added nine points and seven rebounds in the win over Burr and Burton, while Meghan Gilwee had 10 points. In addition to Albertelli’s MVP award, Maryn Askew and Shannon Loiseau were named to the All-Tournament team. Jake Schaefer rushes the puck up the ice during CVU’s game against U-32 on Saturday night at Cairns Arena. 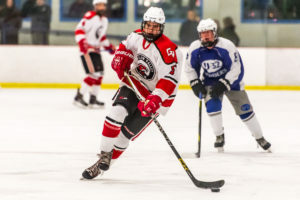 U-32 3, Champlain Valley 0: After two scoreless periods, visiting U-32 scored three goals in the third to earn the win over the Champlain Valley boys hockey team on Saturday. Maxx Perry had two goals for the Raiders, while Liam Roberts tallied once. Rory Hynes earned the shutout with 27 saves. Jake Kindestin made 20 stops in goal for the Redhawks, who fell to 0-2. The Champlain Valley-Mount Mansfield girls hockey team travled to South Burlington for the Hockey 4 Hope Classic at Cairns Arena on Friday and Saturday nights. On Friday, the CVU-MMU co-op fell to Hamden, Conn., 4-0 in the opening game. Joanna Wright stopped 30 shots in a losing effort for the CougarHawks (1-2-1). On Saturday, Lydia Maitland scored a goal with under six minutes remaining to salvage a tie with South Burlington in the tournament’s consolation game. Jackie Ryan also scored, while Emily Zambrano had an assist on Maitland’s tying goal. Wright made 20 saves.